 A 4-day weekend is all you need to get a taste of the Pacific North West. 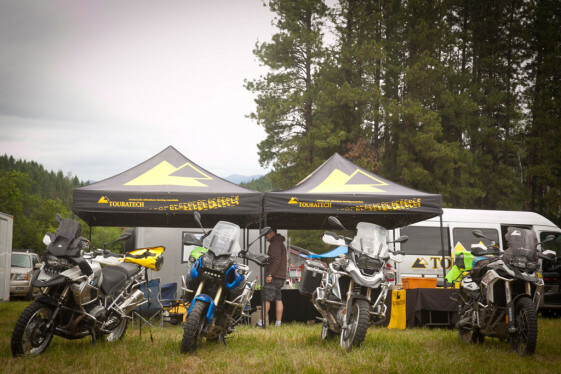 The Touratech Rally was held in the heart of the beautiful Wenatchee National Forest. It had always been a dream to experience the volcanic peaks and dense evergreen forests of the Pacific North West. While the Washington Backcountry Discovery Route might be the best way to experience the Cascades, we were pressed for time looking for a trip we could do in a long weekend. 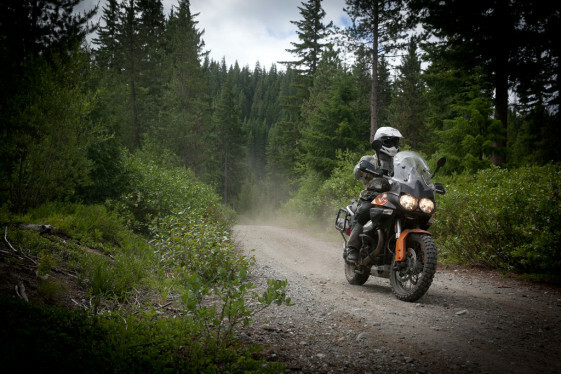 The Touratech Rally, held in the small town of Plain Washington, offered the perfect opportunity to get a taste of the Pacific Northwest. Getting to and from Washington from Southern California would require 6-days of travel, so we looked into the Fly-N-Ride option. 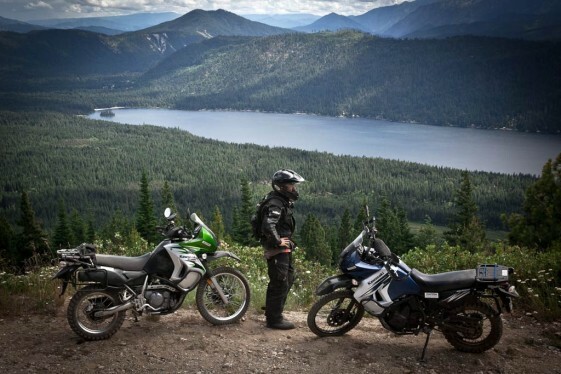 We discovered TourUSA, a motorcycle rental and tour company that offers Adventure Bike rentals and tours in the Seattle area. 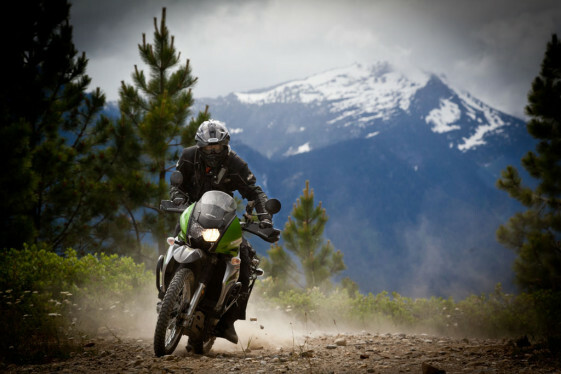 Their fleet of Adventure Bikes includes the BMW F800GS, BMW F650GS and Kawasaki KLR650. 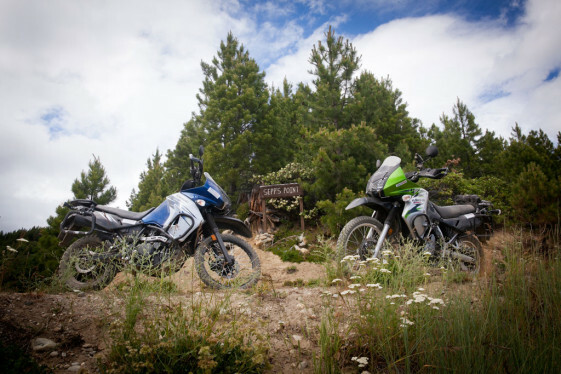 We decided to rent a pair of KLR650s, which would be perfect for the technical trail riding in the woods of Wenatchee National Forest. We flew to Seattle on Thursday morning and caught a cab over to our bike pickup location at the Touratech USA Headquarters. Two KLR650s were there waiting for us, nicely appointed with Touratech accessories that included panniers, skid plate, hand guards, headlight guard and crash bars. The bikes looked well maintained and included a toolkit for basic repairs and maps of the surrounding area. We picked up these two beautiful KLR 650’s and got supplies from the Touratech USA headquarters shop. After picking up a few camping supplies from Touratech’s shop, we were on our way out of the city. Riding Highway 90 through Snoqualmie Pass, the snow-capped peaks looked reminiscent of the Alps of Europe. We hit light rain near the summit, but the sun shone brightly once we crossed over to the backside of the Cascades. 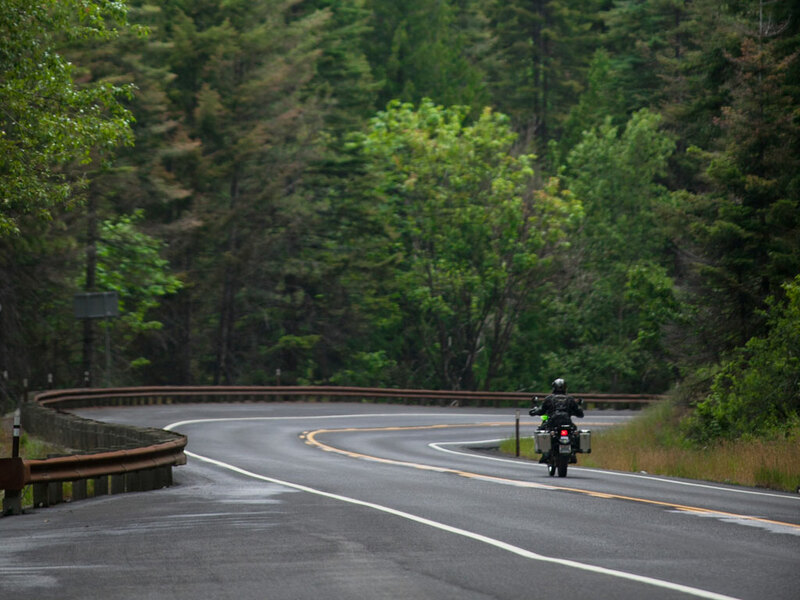 The vibrant green landscape dazzled our eyes, as we enjoyed the curves on Highway 97. We arrived at the Touratech Rally in just two and a half hours feeling relaxed after a pleasant ride. Occasional light rain is to be expected in the Pacific North West. It reduces trail dust and keeps everything looking vibrant green. Upon entering the Rally, we received a goodie bag and were escorted to our designated camping area. Bikes went on one side and tents on the other, with a row in-between for people to ride in and out of camp easily. The facilities included several food vendors, clean portable restrooms and even a free outdoor shower. Across the street from the event there was a store, hotel, restaurant and gas station. After setting up camp, we quickly made friends with our neighbors and got settled in. We realized how far we had traveled north when the sun didn’t set until 10pm. The Northern Lights are visible in this area, but we were not lucky enough to witness them. We woke up early the next morning to look over the trail ride descriptions. 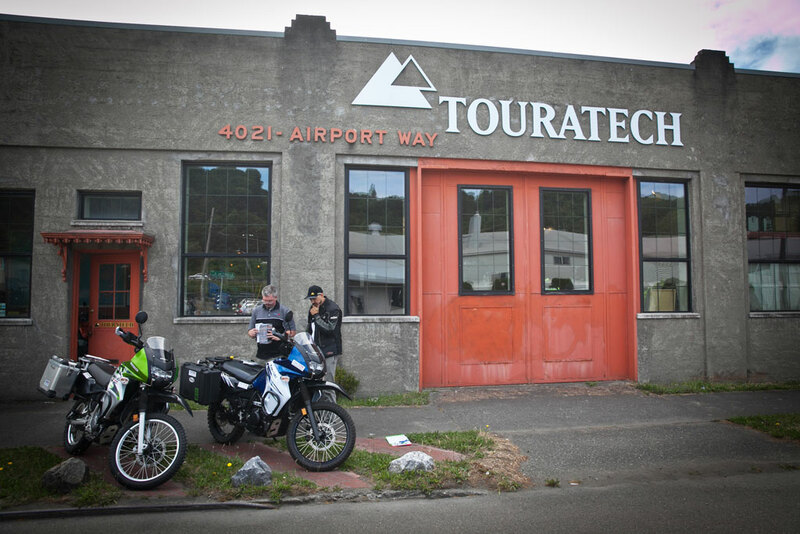 Touratech USA is based out of Seattle, Washington and the mountains around the Rally are right in their back yard. 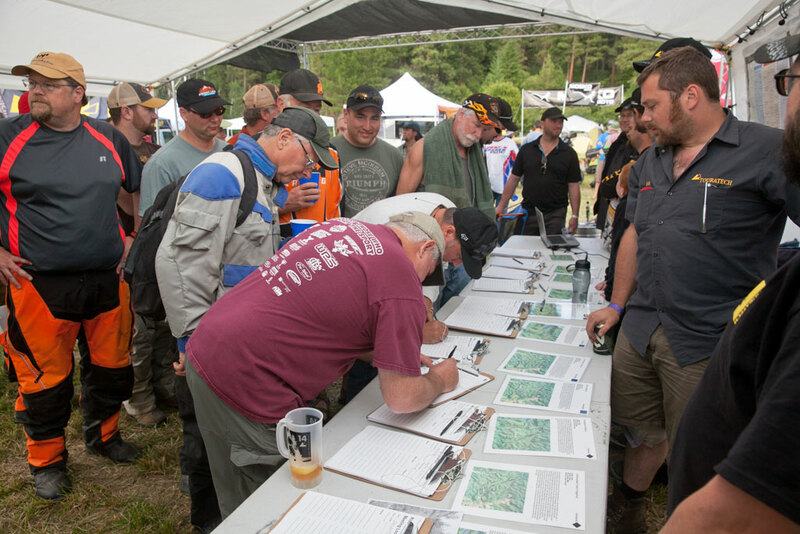 Rally participants received more than 600 miles of GPS tracks, hand picked by Touratech staff, that included some of the best forest routes Washington has to offer. Professionally guided tours led by Touratech staff were scheduled throughout the day, or you could download the GPS tracks and ride them on your own. Riders getting signed up for the guided tours. The guided rides were well organized and limited to small group sizes to keep dust down to a minimum. All routes were designed to be traveled in one direction to improve safety on blind corners. There were plenty of guided rides available for everyone and Touratech was quick to add additional tours as demand required. We wanted to soak in some of the scenery, so we chose an intermediate ride with a mixture of gravel roads and two-track trails. “Don’t tell mom we just did that!” Touratech USA General Manager Paul Guillien and his fearless son Daniel lead our morning group ride. The owner of this beautiful Moto Guzzi Stelvio wasn’t afraid of riding his bike aggressively in the dirt. 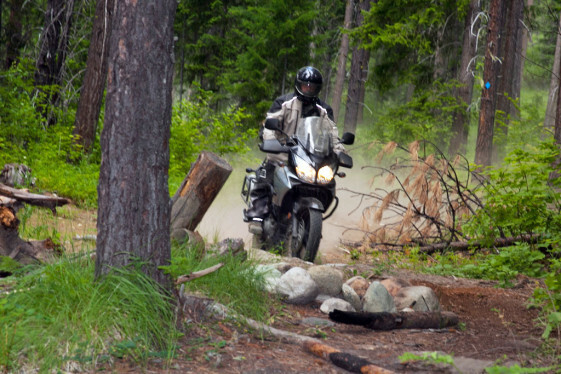 A Suzuki V-Strom owner navigates confidently through a tight section of the trail. 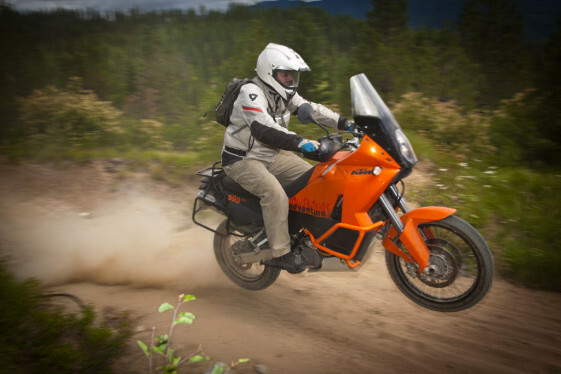 A KTM 990 Adventure rider gets his bike airborne on the trail. Our morning group ride was thoroughly enjoyable. The trails were uncrowded and the dust was minimal. Several challenging sections on the route kept everyone entertained. We were amazed by how green and thick the forests grew; a stark contrast to the dry landscapes we typically ride in Southern California. After taking a quick lunch break, we were back on the trails again. This time on our own self-guided tour to Sepp’s Point. The Sepp’s Point ride took us on a rocky dirt road up to an overlook with breathtaking views of Lake Wenatchee. Our rented Kawasaki KLR650s were the perfect tool for the rugged trails of Wenatchee National Forest. Enjoying the stunning views of Lake Wenatchee from Sepp’s Point. We had fun drifting on the slick gravel roads, but had to be careful around the blind turns and cliffs. Back at camp in the afternoon, the seminars were taking place under the main tent. Adventure Touring experts covered topics like fixing flats, trailside repairs, advanced GPS, cooking on the road, moto photography and packing tips. Four-time Baja 1000 winner and Dakar Rally Top 10 finisher Quinn Cody was there to teach a Rally Navigation class. Racing legend Quinn Cody and Touratech’s Iain Glynn provided training on how to use a Rally Roadbook. Happy Hour began at around 6pm and two kegs of free beer were rolled out for the crowd to enjoy. Near the end of the evening the campfire raffle drawings occurred, where fun prizes were thrown out to the crowd. It seemed like everyone was winning something and this drew a large crowd. Saturday was the last full day at the Touratech Rally and last chance to enjoy the superb riding in the area. 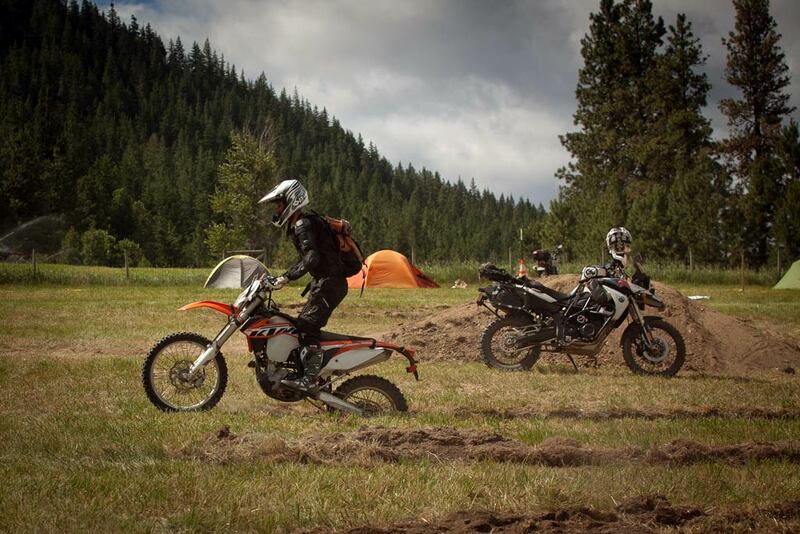 Many of the riders took part in Quinn Cody’s Rally Navigator Experience that allowed participants to test their skills navigating sans GPS. Competitors ran through a 60-mile timed course using only a roadbook and compass, just like the Dakar Rally (look for the upcoming feature story about our thrilling ride in the Rally Navigator Experience). 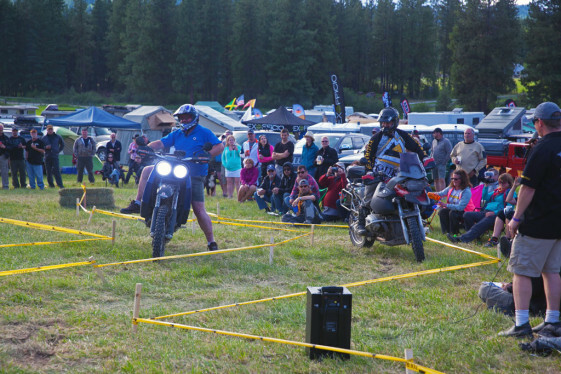 Many riders came to the Touratech Rally for the opportunity to improve their off-road riding skills. One of the top off-road training schools PSSOR (Puget Sound Safety Off Road) was on site offering two different off-road skills courses. The training course had many different challenging obstacles, including hill climbs, sand pits, rock beds and log jumps. 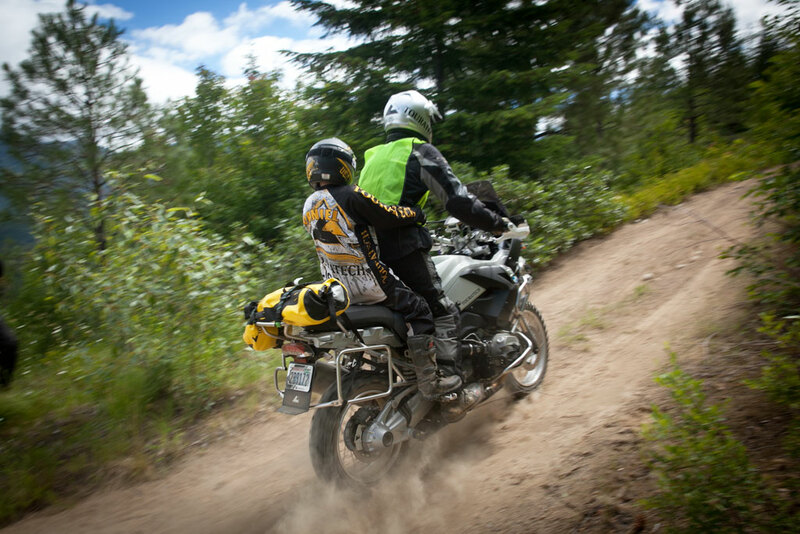 A student of the PSSOR off-road training program improves his skill riding through ruts. After two full days of riding, it was time to hit the vendor booths. Many popular Adventure Bike companies had their products on display and there was free swag to be had at some of the booths. 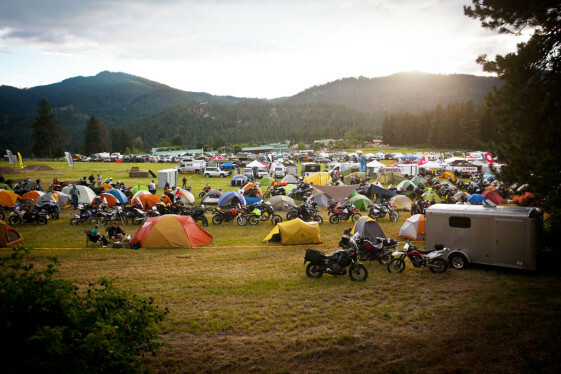 The vendor booths are a great place to discover new Adventure Bike products and get product demos from company reps. Vendor booths provide a great opportunity to test out the latest products for Adventure Riders. This camping chair from Best Rest was comfy but a bit on the heavy side. 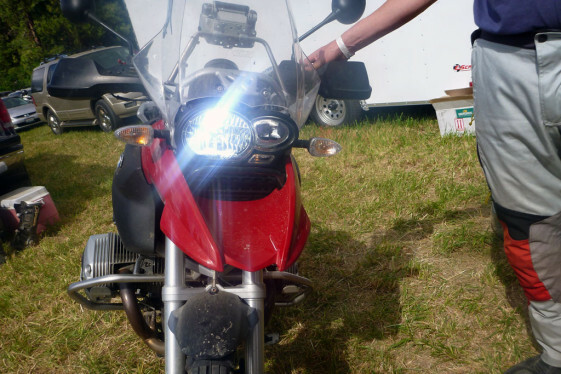 Cyclops Adventure Sports had their new ultra-bright LED off-road headlight bulb on display. This customer purchased a bulb and had it installed on-site. These fully accessorized Touratech bikes were there for everyone to admire. The highlight of the final night was definitely the slow race. Riders competed against each other to see who could complete the course slowest. But this wasn’t your typical straight line slow race. The course was set on a sloping hill with several curves. It took incredible clutch control and balance just to complete the course at any speed. 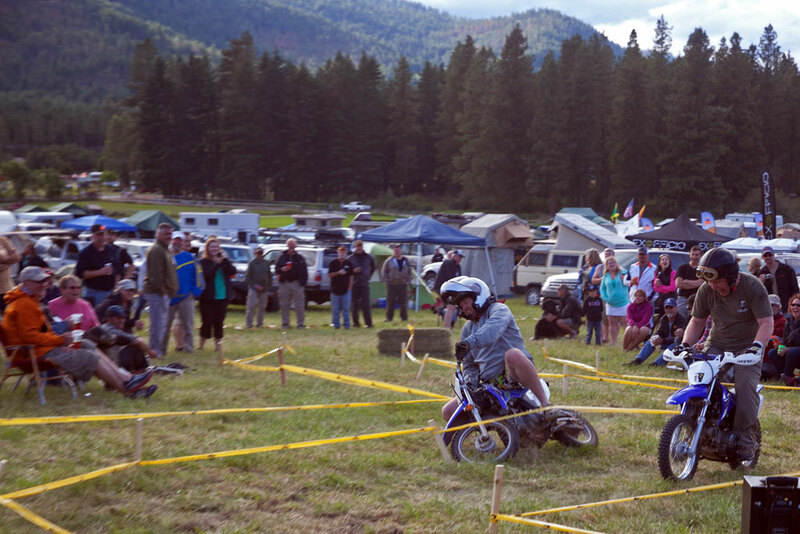 The competition was intense as riders lurched, contorted their bodies and gritted their teeth in an attempt to keep their bikes from tipping over. Touratech’s Iain Glynn displayed impressive slow racing skills during the competition and took the win on a BMW R1200GS Adventure. Competitors tried to beat Iain on a mini-bike, a trials bike, even Baja Champ Quinn Cody gave it a shot, but he remained unbeaten. 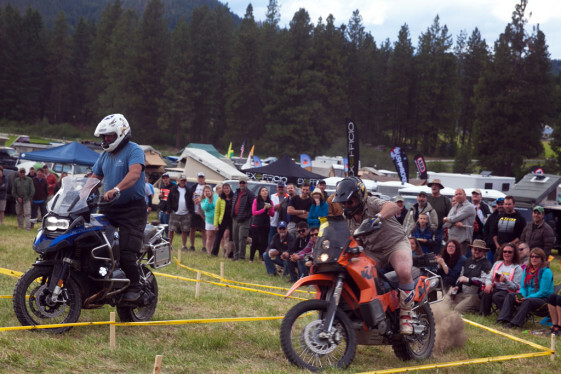 Touratech’s Eric Archambault (right) wears a pair of revealing shorts to distract competitors during the slow race. The mini-bikes seemed to fall over just as quickly as the large adventure bikes. Cyclops Adventure Sports owner Darryl VanNieuwenhuise (left) puts a foot down and loses a slow race against the eventual champion Iain Glynn (right). But the fun had to end, and Sunday morning we packed up early, said goodbye to friends and headed back to Seattle. We crossed over the Cascade Mountain range on Highway 2 through Stevens Pass and were greeted with views of lush forests and ski villages. Dropping off the KLR650s in Seattle went smoothly and we were soon flying back home to Los Angeles. We were able to pack in a lot of activities on our 4-day Fly-N-Ride trip to Washington. Overall, we were impressed with the Touratech Rally and all it had to offer. The Touratech crew were well organized and made sure everyone got the most out of their experience. We also enjoyed riding the KLR650s we rented from TourUSA that worked flawlessly for the entire trip. •	Camping fuel canisters and CO2 cartridges are not allowed on planes. •	Before leaving, research where you can buy fuel canisters on arrival. •	Fly wearing your boots and jacket to avoid overweight baggage fees. •	If you have a lot of stuff, consider shipping some things ahead of time. •	Bring an inner-tube or tubeless repair kit and pump for flat repairs. •	Find out if your rental bike has a 12v charger for your electronics. •	Confirm that your rental bike includes a good tool kit or bring your own. For additional photos of the Touratech Rally, check out our album on Facebook.  Can a Big ADV Bike Conquer the World’s Toughest Enduro Race? That looks like so much fun!!! So bummed I missed this event. Excellent write up. One of my to do items is to get to this rallye.